DO: Call the Child Abuse Reporting Number for your California county, or contact your local Police or Sheriff’s Department and report your concern. You can call anonymously, unless you are an official mandated reporter. EXPECT: The County Child Welfare Agency must conduct a risk assessment to decide whether the child needs protection. FOLLOW UP: The County Child Welfare Agency will not share information about their investigation with you. DO: Ask the County Child Welfare Agency to immediately commence court proceedings to bring the child under the protection of the juvenile court by filing the Juvenile Court Form JV-210. For detailed information about how to file the JV-210, see Advokids Legal Tools/For Anyone Seeking A Child's Protection through Juvenile Court. EXPECT: The County Child Welfare Agency must immediately investigate the child’s situation after receiving the JV-210. FOLLOW UP: Within three weeks, the County Child Welfare Agency must send you the JV-210 form to notify you of their decision. If they decide not to bring the child under the protection of the court they must state their reasons on the form. DO: If the County Child Welfare Agency decides not to seek protection, you may go directly to the juvenile court and ask for review of the agency’s decision, using Juvenile Court Form JV-215. 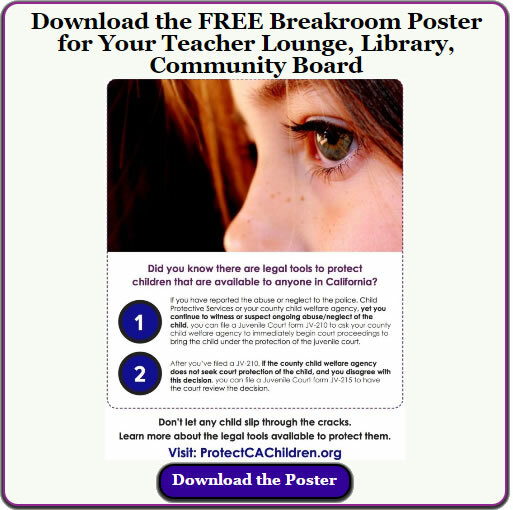 For detailed information about how to file the JV-215, see Advokids Legal Tools/For Anyone Seeking A Child's Protection through Juvenile Court. EXPECT: You will receive a call or letter from the juvenile court clerk telling you whether the court decided to bring the child under its protection. FOLLOW UP: There is no timeframe within which the court must make a decision, but you can expect a prompt response. These requests are rare and will be treated with great urgency. Take Steps To Ensure An Abused Or Neglected Child Does Not Slip Through The Cracks. "Child abuse is on the rise, the number of children entering foster care is increasing, and our social workers are overburdened. We all need to take responsibility for protecting vulnerable children. We all need to know about the simple legal forms that can be used by anyone - teachers, relatives, neighbors, caregivers - to bring a child under the protection of the juvenile court." Eight-year-old Gabriel Fernandez (shown here in an undated family photo) died after months of abuse by his mother and her boyfriend. 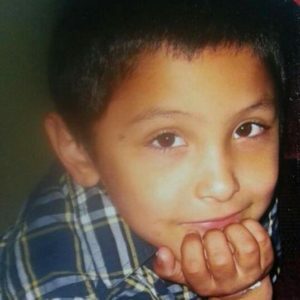 Gabriel’s teacher and others reported the child abuse multiple times, but authorities failed to remove the child from the home where he later died. Had Gabriel’s teacher, family members and others known about the JV-210 and JV-215, Gabriel’s death may have been prevented. We need your help! Use Advokids social tools to spread awareness about how to protect children from abuse and neglect.